Specialty drugs are products used to treat complex chronic conditions such as cancer, rheumatoid arthritis, HIV, and multiple sclerosis. While they are usually associated with increased patient quality of life, better disease management, and in some cases, cures, specialty drugs are expensive therapies that are catching the attention of key stakeholders, such as payers and providers. Industry trend reports over the past few years have demonstrated that specialty drugs have been and will continue to be the fastest growing segment of drug spend under the prescription benefit. This growth has created a ripple effect, impacting patients and employer groups, inducing a financial strain on the overall healthcare system, and placing added responsibility on payers. Now more than ever, Pharmacy benefit managers (PBMs) are tasked with developing effective cost-containment solutions. To accomplish a cost-effective specialty drug benefit, MedTrak’s philosophy is to be proactive vs. reactionary in the dynamic landscape of specialty drugs. The implementation of the Best-In-Class or “BIC” SpecialtyRx Program has proven to be one of the most successful offerings within MedTrak’s Clinical Suite of Programs. The first layer of a cost-effective specialty drug benefit includes the development and maintenance of solid prior authorization criteria. All specialty medications are subject to review, in order to ensure that Plan Sponsors are not exposed to unnecessary costs. MedTrak’s CCC is tasked with and constantly strives to be on the cutting edge of information coming out of clinical trials, consensus guidelines, and other bodies of evidence guiding the most appropriate use of medication therapy. In addition, MedTrak has implemented a New-to-Market drug coverage policy. New-to-market products and new variations of products already in the marketplace will be excluded from benefit coverage until the product has been evaluated, deemed clinically appropriate, considered cost effective, and assessed for place in therapy. In order to allow adequate time for the CCC to perform a full evaluation, it is MedTrak’s policy that new drug entities not be eligible for benefit coverage for a period of 90 days after market entry. Requests for coverage made prior to 90 days after market entry will be declined. 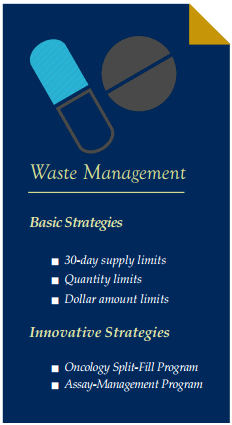 This strategy helps to minimize costs and provide evidence-based decisions and recommendations. It’s a comprehensive approach to managing appropriate medication use by optimizing care and outcomes for our members and minimizing unnecessary costs for our Plans. Clients also have the option of selecting various formulary options, to further incentivize members to use preferred formulary alternative therapies over non-preferred or excluded products, thereby enhancing opportunity for additional savings and rebates back to the Client. Due to the frequency of side effects and discontinuation rates associated with certain chemotherapy medications, MedTrak has implemented a Oncology Split-Fill Program. The primary purpose of this program is to avoid unnecessary waste and therefore unnecessary costs to both Members and Plans due to early discontinuation of any of these medications. With this program, a Prior Authorization has been entered to allow up to 2-week supplies of drug for 12 weeks. The members’ co-payments are adjusted proportionally. Members and physicians are informed of the approval and the Split Fill Program. After this trial period, claims can then be submitted for original quantity. Assay and Inventory Management Program - By administering hemophilia benefits through this program, MedTrak guarantees that the blood clotting factors dispensed for a particular member will always be within ±3% of the written prescription. Medical Drug Channel Management - This program redirects select specialty medications associated with a J-Code (for medical billing purposes) to the prescription benefit for processing, thereby providing an opportunity for substantial savings to our Clients. In a recent analysis of the Oncology Split-Fill Program, fifteen patients prematurely discontinued treatment on odd fill dates, which resulted in substantial savings to the plans. For more information about MedTrak Best-In-Class SpecialtyRx Program, contact your MedTrak Account Manager to discuss your Plan’s specific statistics and cost management strategies. HIRC Specialty Pharmacy Provider Landscape 2012. Accessed August 20, 2015. IMS Health White Paper. Succeeding In the Rapidly Changing U.S. Specialty Market 2014. Accessed August 20, 2015. EMD Serono Specialty Digest, 11th edition. Accessed August 20, 2015. The 2014 Drug Trend Report. The Express Scripts Lab. Accessed August 20, 2015.